Master Chocolatier Iain Burnett, the Highland Chocolatier, announces a UK first with the official launch of his unique, audio-guided, Chocolate Tasting Flights. Much more than a selection of chocolates, foodies will delight in this unforgettable gastronomic experience. Sitting down to a “flight” of Iain Burnett’s exquisite and international award-winning chocolates laid out on a tasting mat, the listener is given an informative view of the Master Chocolatier’s experience as an acclaimed truffle specialist and then staged insights into each of five very different artisan chocolates. Skillfully presented, Iain leaves room for us to come to our own conclusions based on our individual tastes. Both highly informative and luxurious on the palate, we are given a chance to savour and unravel the incredible, complex flavours and textures of Iain Burnett's signature Velvet Truffles and Velvet Pralines. These astonishing chocolates have received over 40 awards including World Gold at the International Chocolate Awards – twice. Iain Burnett is somewhat of a specialist in his field. 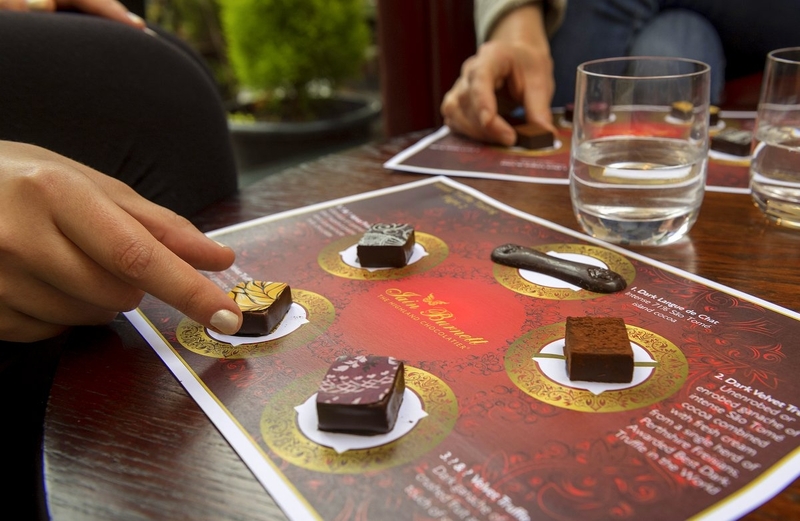 He has spent over a decade creating hundreds of chocolate pairing flights for Master Distillers and Champagne Houses and seen how much people enjoy learning from a carefully arranged sequence. “It’s a natural evolution that gourmet couverture chocolate, itself like fine wine, should have its own pure chocolate flight,” he explains. Order online one version of the Chocolate Tasting Flight, complete with audio link, to try in the comfort of your own home or dispatch to foodie’s worldwide. Or make a reservation on 01887 840775 to experience a Tasting in the cosy Chocolate Lounge next door to Iain’s Chocolate Kitchen. This version has a bonus audio guide which takes you through his Chocolate Exhibition and more of the process of creating gourmet chocolates from the humble bean. For the culinary craftsman to the consummate chocoholic, this is truly a rich, sensory experience not to be missed. International award-winning Master Chocolatier and specialist producer of the unique Velvet Truffle. Twice awarded Best Truffle in the World. Academy of Chocolate Gold, Silver, Bronze. Triple Gold Star at Great Taste Awards. Twice Best FoodService Product at Food&Drink Excellence. © Copyright 2019. Iain Burnett Highland Chocolatier.